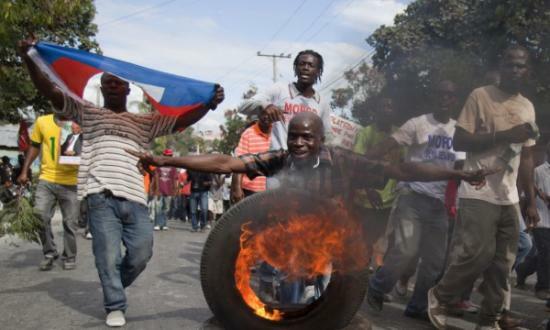 A pair of motorcycle cops doing a patrol through a Haitian shantytown in the outskirts of the Dominican capital, Santo Domingo, intervened in a quarrel between a group of Haitian nationals, only to be pelted with stones. The officers were forced to seek refuge inside of a house, relying on a good Samaritan who turned on their motorcycle and held it for them until they managed to escape from a situation that could have quickly escalated to their lynching, as has happened in recent weeks on the border between the two Caribbean nations, who share the island of Hispaniola. Sadly, such incidents are becoming more common in the Dominican Republic, where self-segregating communities increasingly rely on violence to keep authorities from enforcing the law and regulating simple things such as education and sanitation. A stunning undercover investigation by Addis Burgo of TeleUniverso revealed a complete network of schools where Haitian students, many without birth certificates, are taught in Creole and French instead of Spanish, with the national flag nowhere visible as demanded per Dominican law. TeleUniverso contacted the Dominican Ministry of Education, who claimed to have absolutely no knowledge that these schools existed, while failing to indicate if it was going to take action against them. Although many politicians in Europe are alarmed at the prospect of unintegrated immigrants creating more parallel communities such as Molenbeek in Belgium, where jihadi ideology predominates, Dominican authorities already have to deal with entire swaths of the country where people refuse to recognize their legitimacy, often finding themselves in life or death situations when responding to violence. In many of these communities, where unintegrated immigrants make up over 90% of the population, murders and rapes go unreported, and language difficulties in such a hostile environment make investigations nearly impossible for police officers. Although TeleUniverso was able to record footage of unlicensed educators teaching in classes where the law was being violated in flagrante, the Dominican government is unlikely to take action due to heavy opposition from organizations such as Open Society, backed by billionaire George Soros. Open Society has over the past years labeled any attempts by the government to regulate its schools and its border policy as "racism," despite the fact that most Dominicans have African ancestry. Social mobility in Haitian no-go zones is almost non-existent, and residents live in a precarious situation not much better than back home in Haiti, which is currently a failed state. The Dominican population is expected to plateau at 12 million in 2070, when it will begin an interminable decline. Since Haitian women are reproducing at far higher rates than Dominican women, the very borders of the Haitian nation are expanding, with the prospect that the Dominican government will one day be forced to re-negotiate the frontier by its numerically-superior neighbor.